This amazing bumper Etsy planner is designed with an Etsy shop in mind. It is available as an instant download and has 82 printable letter sized planner pages to help you organise your home business. This business binder kit contains all of our etsy shop planner pages in a new design. 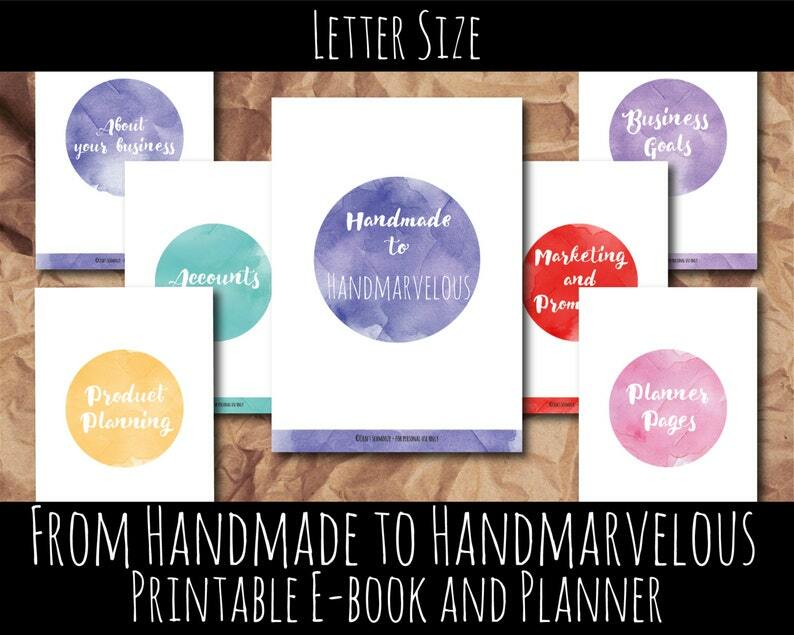 Also contained in this small business planner is a 14 page handmade business E-book which is JAM PACKED full of helpful info and tips to help you go from handmade to handmarvelous! This large planner comes as an Letter sized PDF printable, where you can print as little or as often as you like. You can simply hole punch and add it to your business binder to really get your business on the map and organise your sales and marketing strategy. And just like our mantra says, business stationery doesn't have to be boring, and this planner is gorgeously decorated with stunning watercolour graphics. Here's what's included in this work planner business printable! SEE! Lots of gorgeous work planner pages to keep your small business on the right track! Everything an Etsy seller or small business owner could want from a business planning kit. If you would like to see some of these sections in closer detail visit the link below! Due to the design of this printable planner, if your printer does not have borderless printing capabilities then you may get a thin white border around each page. All designs remain the property of Craft Schmooze. All of our printables are only available for personal use only. Anyone found to be using our designs or printables for anything other than personal use will be contacted by our legal team. There are no refunds on instant download items - Please contact us should you have any queries prior to purchase. We stop taking orders on the 26th of November for sales outside the UK. We will open for international orders once we open again in January. Any items with a 7-14 day turnaround will be removed temporarily from the shop on the 30th November. This includes larger items of business stationery and display items. Any items that are quick to make or ready to post will remain in the shop until the 14th of December. We do not guarantee items in time for Christmas when purchasing standard post. The postal service is extremely busy at this time of year. As our standard post does not include tracking, we suggest if you would like to track your post you purchase the tracked shipping option at the checkout. The shop closes on the 14th of December 2018 and will reopen on the 4th of January for our annual Christmas break. 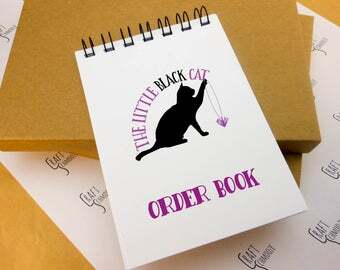 business calendar for online sellers and small business owners - Can be personalised with logo! Mini Christmas lights for DIY Christmas gifts and card making, maybe even fairy gardens or for dolls houses! Ribbon came out very nice, cant wait to use it. Where do I send my logo and in what format? Please send your logo post-purchase to info@craftschmooze.com. Please quote your order number when doing so :) Please send the file in either a Jpeg or PNG format in at least a 300dpi format. You may also send a pdf file but please ensure all fonts are outlined or embedded. Our turnaround times vary from product to product. But for additional information please see our shop info. We normally state if turnaround times have been extended due to volume of orders. We work Monday to Friday 9am to 5pm so if you message us out of these times please be patient, we will contact you during the next working day. If the processing times state 3-5 days, for example, please note these are business days! If you order after 5pm on a Friday, we will not start processing your order until the Monday. -Please note the quoted turn around time is if we receive print ready imagery, please add a few days to the expected turnaround time if your item requires custom work. - If the details and imagery we need to process the order aren't supplied at the time of the order, this may cause a delay in the order being shipped. What font options do you offer for personalised ribbon? In our ribbon listings, you will find the font options you have available in the listing photos. What are your current processing times? Our current turnaround time is approximately 7-14 business days. You guys are certainly keeping us busy!!!! - We cannot print images, text or logos that are trademarked or copyrighted onto our goods. -If you request images that belong to Disney or Marvel (as an example, but not limited to) we cannot print them. - We use FSC certified papers or recycled papers to ensure our products are sustainable. - We are part of various toner and cartridge recycling schemes to limit our plastic waste. - We use recyclable packaging where possible. - We also support the eco-brick scheme to ensure any plastics that can't be recycled are given a second life. - We buy our supplies in bulk to reduce the amount of deliveries to the business. - We group jobs so that our machines are not running constantly. - We are currently researching ways that our studio can be powered with renewable or natural energy.